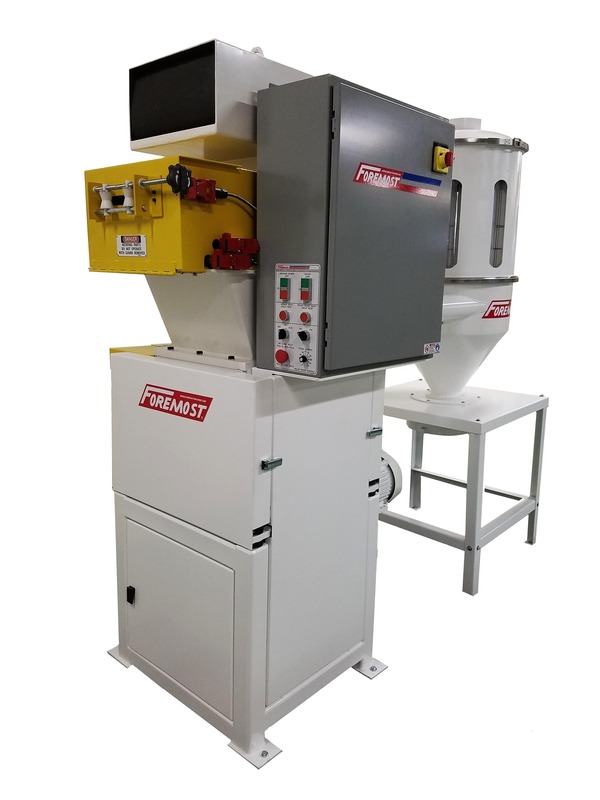 High Shear Film and Sheet Granulators – SHFG 1116, HSFG 1116, 1132, 1148, 1632 – Foremost Machine Builders, Inc.
Our High Shear Film and Sheet Granulators are suitable for a wide range of applications including grinding sheet, film, roll stock, edge trim, and slabs. Specific models are available for each type of granulating and all are offered with optional SQ sound attenuation for granulating at under 80 dBA. Without this treatment, utilizing our standard sound panels, a respectable 85 to 90 dBA range can still be achieved. Unique design permits easy knife removal for off-the-machine resharpening without disassembling the rotor itself. This grinder has a hinged cabinet, which can be opened or removed without tools for total access when maintenance is required. The cutting chamber is accessible from front and rear chamber access doors for cleanout or knife adjustable from above the machine. Airveying System: Integrated to granulator for continuous automatic unloading. Sound Treatment: Microsonic sound deadening treatment on the hopper and removable sound attenuated panels around the cutting chamber and motor.